Cox Automotive Industry Update Report: September 2018 - Cox Automotive Inc.
ECONOMIC INDICATORS: The economy is on track for real GDP growth of less than 3% in Q3. Hurricane Florence-related demand could cause a temporary spike in vehicle prices. DEMAND: Both New and Used vehicle sales were flat YOY with the same number of selling days. SUPPLY: The days’ supply for August was 67, down 2 days YOY and up 2 days from July. The September 2018 Cox Automotive Industry Update Report shares Cox Automotive’s multifaceted insight into the automotive marketplace to provide an overview of economic indicators, supply, demand, credit and other vital topics and trends affecting the industry. Areas impacted by Hurricane Florence have lower vehicle density than the areas around Houston and Florida that were impacted by hurricanes last year. Likewise, preparations were better and evacuation was more widespread. As a result, Hurricane Florence-related vehicle damages will likely be less severe than those experienced in Houston and, if current Cox Automotive estimates hold, are expected to have much less of an impact on vehicle prices. However, because Used supply is already constrained, additional demand could cause a temporary additional spike in prices. The economy is on track for real GDP growth of less than 3% in Q3, a clear deceleration from the 4.2% growth in Q2. Fear of higher prices caused by tariffs has driven strong auto sales and increases in auto credit this summer. This boosts the market now, but at the expense of sales that otherwise would naturally occur later in the year. While consumer spending is on a downward trend from the tax-reform fueled peak in Q2 and July, preliminary September estimates from the University of Michigan show that consumer sentiment has rebounded strongly to a 6-month high. year’s 16.5 million. Light trucks outperformed cars in August and were up 9% YOY. Market share for cars came in at 29.4% in August, the lowest monthly level ever. Cox Automotive estimates that Used vehicle sales were flat YOY in August with the same number of selling days. The annualized pace of used vehicle sales remains up 1% YOY at 39.5 million. The estimated August used SAAR was 39.6 million, also flat YOY FCA and Ford saw the biggest gains in August, with FCA sales increasing 10% and Ford sales increasing 4%. Subaru had the best month in company history, with sales up 1%. The days’ supply for August was 67, down 2 days YOY and up 2 days MOM. Average car day’s supply was 61, down 6 days YOY and up 2 days MOM. Light truck day’s supply was 70, down 1 day YOY and up 3 days MOM. The August average incentive spend came in at $3,784, up 1% YOY and up 0.2% MOM. August average incentive monthly YOY growth was the lowest for 2018. 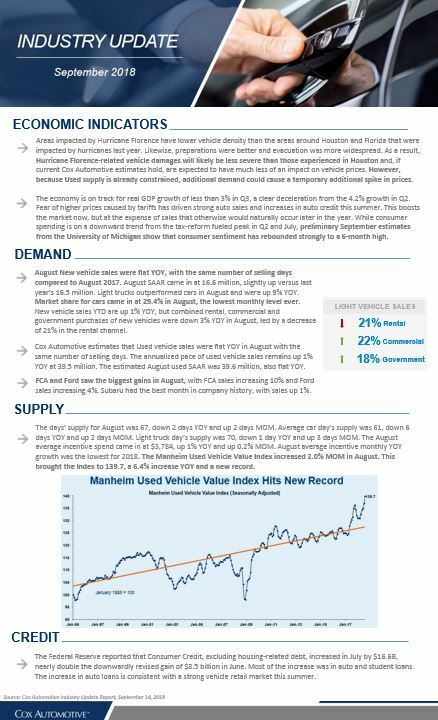 The Manheim Used Vehicle Value Index increased 2.0% MOM in August. This brought the Index to 139.7, a 6.4% increase YOY and a new record. The Federal Reserve reported that Consumer Credit, excluding housing-related debt, increased in July by $16.6B, nearly double the downwardly revised gain of $8.5 billion in June. Most of the increase was in auto and student loans. The increase in auto loans is consistent with a strong vehicle retail market this summer. Get the full September 2018 Cox Automotive Industry Update Report to learn more.